Our Firework and Noise Phobia is a tremendous asset towards helping your dog to cope with this fear, and following our behaviour modifications will give you additional tools to help your dog and will bring about a quicker turn around in your dog’s coping mechanism. Something to bear in mind is that some people think that their dogs are fine with fireworks as the behaviour is that they will jump up as if trying to catch them – spin around, bark and be very excited. This dog is NOT coping – it has gone into F = Fooling Around mode, which is one of the behaviours dogs exhibit if they are not coping with a situation. Something to bear in mind is that some people think that their dogs are fine with fireworks as the behaviour is that they will jump up as if trying to catch them – spin around, bark and be very excited. This dog is NOT coping – it has gone into F = Fooling Around mode which is one of the behaviours dogs exhibit if they are not coping with a situation. Whereas using desensitizing with dogs with Storm Fear Phobia is not very effective, it is much easier to desensitize your dog to the sound of Fireworks (and any loud noise and is simple to do as explained below), and I have incorporated some counter-conditioning as well – this is basically teaching the dog to do and enjoy something else while the noisy bangs are around – and changing its perception of something that was frightening to something rewarding. Simply turning on the radio or TV and singing along with a song will help both you and the dog to relax - the volume to be louder than usual to help to subdue the noise of fireworks. .
Never force a dog to confront this fear by pulling it out of its safe place or taking it outside to view the Fireworks – this will only increase the fear.​If you have done TTouch you will know how much help a Wrap or Thundershirt can be in helping a stressed dog. There is a diagram below as to how to put a Wrap on a dog and if you do not have one, then a stretchy T-shirt can be used. I have even had a client who could not find her wrap and she tied her pyjama top on the dog and that helped! This fear is very real – it is nothing to be laughed at or taken lightly and it will get worse if not addressed. Before starting the exercises below, spray about 10 minutes before you start. What is crucial here is that you do not progress further until the dog is totally happy and shows no reaction at each stage. Start to have a game of ball or pullies daily with your dog while the above is playing, especially in the evening when it is dark as this is when Fireworks are present. Have two or three balls or ropes and have a good 15 minutes of playing this special game with your dog. Do this inside the home where you would normally be when Fireworks are around and don’t throw the ball far, keep all the action of the game close to you where you are in control and can keep the dogs excitement levels of this game going. These special toys are never used at any other time – they are put away. By doing this you are helping to change the dogs perception of a storm to a rewarding one, rather than a fearful one. If your dog is not toy driven, then use food and find a game to play, such as ‘hidies’ and place food around the lounge, hide behind chairs etc – anything to keep the dogs mind occupied. You can even place some nice strong smelling biltong inside an old sock and drag this on the floor in front of you and it may help your dog to start chasing this object. If you have a dog that will not even react to the suggestion above of food placed in a sock and played with, then follow the directions above of starting with very low volume and a distance away, do the above and substitute a large, raw Femur bone instead. Chose the place the exercise will happen and do exactly the same as above, gradually moving the noise closer and increasing the volume while the dog is chewing on the special bone. The dog only gets this bone when this exercise is done – in-between it is kept in the fridge. After the 15 or so minutes and before the dog is bored of the game, say ‘finished’ and stop the game and put these toys away and turn the recording off. By only having access to these special toys/bone at your practice time the dog will start to get excited at the prospect of the game. When your dog is happily doing the above – then take the next step. Either buy yourself a set of Sounds Scary CD’s or use one of the many You Tube video’s that have Fireworks on them. Work out for yourself the volume control to determine the softest and the loudest BEFORE you start working with your dog. Start the game as above with your dog and have the CD’s or video playing at the lowest possibly sound a good way away from you. Have the game with your dog with the ball/rope. If the dog reacts to the noise, you have it too loud or too close, or both. Desensitize your dog to the noise the CD/video at the lowest volume and only go a step further when the dog is totally ignoring the noise. Bear in mind that dogs sense of hearing is much stronger than ours, so always start at the lowest volume. You will then start to very slowly and gradually, increase the volume over the period of about a week. The time period will depend on the dog’s reaction. It is vital that you do not go too fast and that the dog copes at each and every stage - remember these are various degrees of fear and all dogs are different - what is important is that you go at the speed that your dog can cope with. Your final result will be playing with your dog with the CD/video going full blast and as close to you as possible. Again, the game continues. Although the above is very helpful in helping a dog to cope, it does not feature the smell of the powder or the flashes, but will go a long way to reducing your dog’s stress. 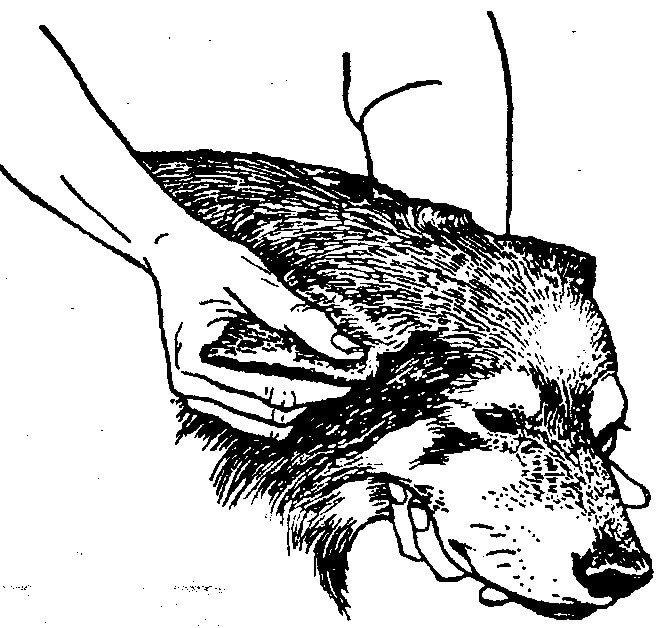 By this stage your dog will be coping well and you can take the desensitizing process further. Start at the beginning again with volume low and CD/video placed far away and let the dog eat its meal with this noise in the background. Yes, we are pairing the noise the dog previously disliked with an event it does like. This exercise is in addition to the counter conditioning above. Gradually build up the volume and distance until the noise is close to the dog. This exercise can be paired with any activity the dog enjoys, even taking a tape recording of it out with you when going for a walk, playing with toys in the garden etc. Always start at the lowest volume and build up. When the Fireworks do start, get your toys/bone out and get going with a really good game, ensuring that you have sprayed both the dog, the area and even the toy. It is often a good idea to also have the large Femur bone available for the dog to chew on if it tires of the game – however, not all dogs will eat (even a lovely big bone!) if the stress levels are too high.